I work in a wonderful quilt shop in New York. Please visit my blog and see what I am working on today! Hi Colleen, I too have tried to leave you a comment on your blog but was unsuccessful. I can't get it to accept my attempts to register. If you know how I can do it, please let me know. Thanks a bunch! Colleen, have tried to leave a comment on your blog, but it won't let me. What do I need to do? I get your blog in my e-mail box. Any suggestions? Thank you for the welcome, you are correct this is a busy time of the year. 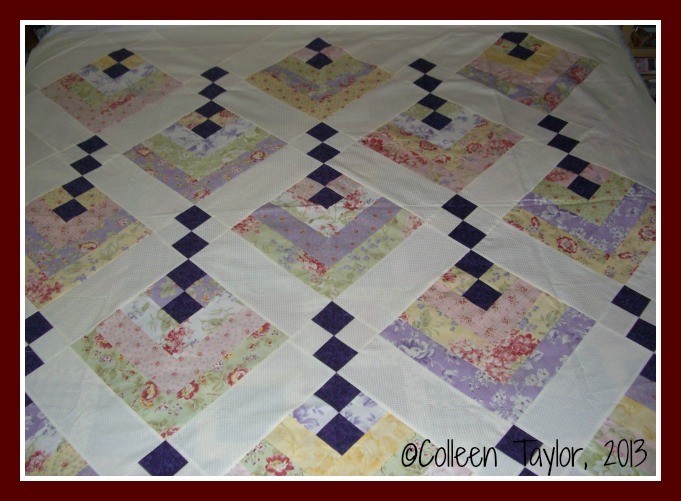 I hope to do more sewing/quilting after the Holidays. Have a Blessed Season. Omg, you should see how gorgeous Deb quilted my Pumpkin Hill! I will bring it to the next sit & sew. I will see you on opening day during my lunch break! So glad the shop is now 5 minutes from my work, 5 and 1/2 minutes from my house!! Yay, is it Monday yet??!!! I feel like I haven't seen you for ages! Have a Happy Thanksgiving! Hi Colleen, you perhaps may know of people personally who need (yourself included) quilts to keep them warm. I have some that I would like to send. If you know of anyone and/or would be willing to accept them, let me know. I don't want to put added pressure on you with all you've been through, but the offer is here. I would much rather have them go to where I know someone is needing them. Thanks a bunch. Will send a friend request so we can communicate. I am so glad they have the support...will seek another family...thanks. Colleen, I am going to send you a check for your niece's friends who lost everything. We want someone to have all the money. They know what they need, better than us. I would like for them to buy the girls some toys...it breaks my heart what has happened. On Mother's Day my husband thinks I should do whatever I want. Sew, that's what I did! Now for a funny Valentine's story. When my husband (gotta love this guy) and I were out to dinner the other night I told him not to get me flowers this year for Valentine's Day. They are too expensive and I would prefer 12 cans of my favorite soup. That's right people, I said soup. Yesterday I had a fantastic day sewing with some friends! I actually made only two pillowcases because I was talking and laughing sew much. The Wedding Weekend was GREAT! Thanks to all who have asked about my son's wedding that took place over Labor Day weekend. If you want to see a few photos (I don't have many as of yet) please feel free to visit my blog! Now it's back to sewing and calmness!!! My son and his fiance were here until this morning so they were around all day yesterday. 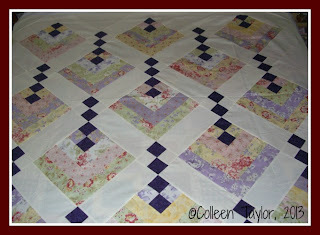 That didn't leave me as much time to get the sewing done on the two quilts. Don't get me wrong...I enjoy having the kids around ~ just not during a deadline! Well, the piecing is complete on the Baseball Quilt for my wonderful brother.